The present portrait of the artist’s daughter, Madeleine, is a stunning work, close to the spirit of Auguste Renoir, full of light and sensibility. Coming from a family of artists, bathed in an artistic milieu, Auguste Leroux became early a successful painter, from 1894 when he won the Prix de Rome in 1894 for his Judith presenting the Head of Holofernes to the people of Bethulia. The young artist then went studying at the Villa Medici from 1895 until 1898. The following years of his career were prolific: he earned a bronze medal at the Exposition universelle of Paris in 1900, created images for the mosaic of the Lady Chapel at the Sacred Heart of Montmartre, was merited with the Legion of Honour and exhibited in several galleries in Paris including the Galerie Allard, Galerie Georges Petit, Galerie Charpentier and Galerie Mona Lisa. Moreover, he was a flourishing lithographer and illustrator to renowned 19th century authors such as Honoré Balzac, Gustave Flaubert, Joris-Karl Huysmans, Anatole France and Giacomo Casanova. Whilst his younger works were imbued with symbolism and allegorical subjects, Leroux’s post-1900 works are characterised by academic precision and a fascination for the female anatomy, visible in his studies of ballet dancers. His time in Brittany, between 1904 and 1910, can be seen as an outstanding artistic exploration. With more coloured and broad brushstrokes, these works combine brilliant tones of Impressionism, Symbolism and Nabis. In the present work, Leroux made a clear distinction in the elaboration of the sitter, his daughter Madeleine, and the background. 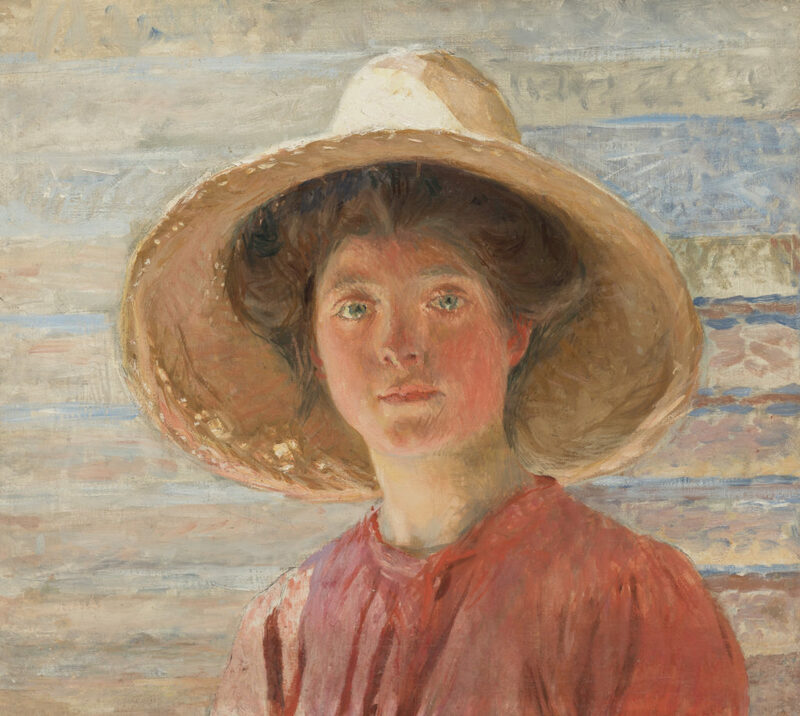 On the one hand, realistically painted, divisionism brushstrokes yield to a very expressive, lively face and sight; on the other hand, the naturally-coloured backdrop with thick and horizontal lines no longer depicts a beach, but instead bears a non-representational and Nabis character. This contrasted structure creates the imagination of a very sunny and warm day. It is worth to mention that Madeleine Leroux (1902-1984) made also a very successful artistic career.